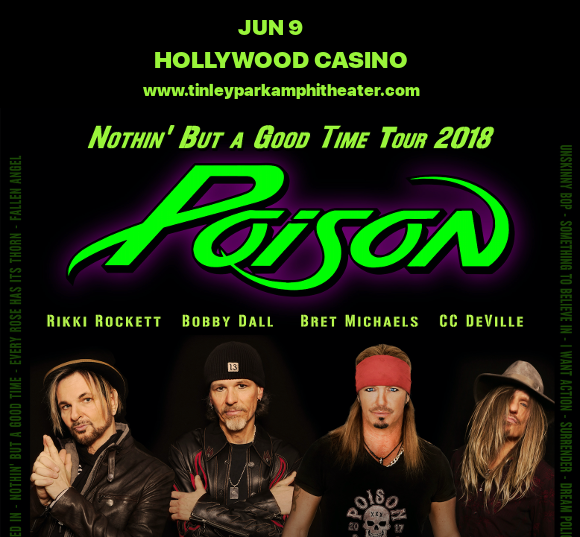 MASSIVE news, Poison fans!! With the all-original lineup, the iconic rock band are on tour in 2018 with Cheap Trick!! They’re on their way to the Hollywood Casino Ampitheatre – get ready to give them a warm welcome on Saturday 9th June 2018! Tickets available NOW – hit the “Buy Tickets,” button to get yours, with no booking fees!! Formed by Bret Michaels, Rikki Rockett, Bobby Dall and C.C. DeVille in 1983, Poison signed to Enigma Records in 1986 and released their debut album, “Look What the Cat Dragged In,” the same year. The album was a massive success, with three smash hit songs, and went on to become the best-selling record Enigma has ever put out!! The band went on tour with Quiet Riot, Ratt, and Cinderella, and their success was sealed. Today, the band have sold over 45 million records across the world. If you can’t wait to experience it all live, then don’t wait too long to get tickets – they won’t!! Buy yours now and get ready for Poison and Cheap trick on June 9th!! !